In the 1970s, Providenciales was “discovered” by the jet-setters of that era. A fun-loving, pedigreed crowd with names like duPont, Ludington and Roosevelt flocked by private jet to Provo’s deserted white sand beaches, gorgeous turquoise seas and lobster-laden reefs to frolic in the sun. In the year 2009, today’s hip sophisticates come to Provo seeking relaxation and renewal in a luxurious, yet informal atmosphere — and their favorite locale is rapidly becoming the new Wymara Resort. 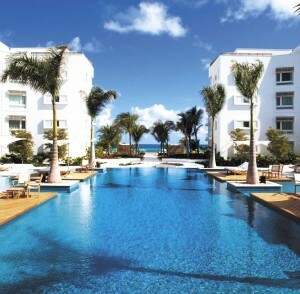 Ganesvoort is a growing group of upscale, contemporary lifestyle hotels that attract a loyal and passionate following. 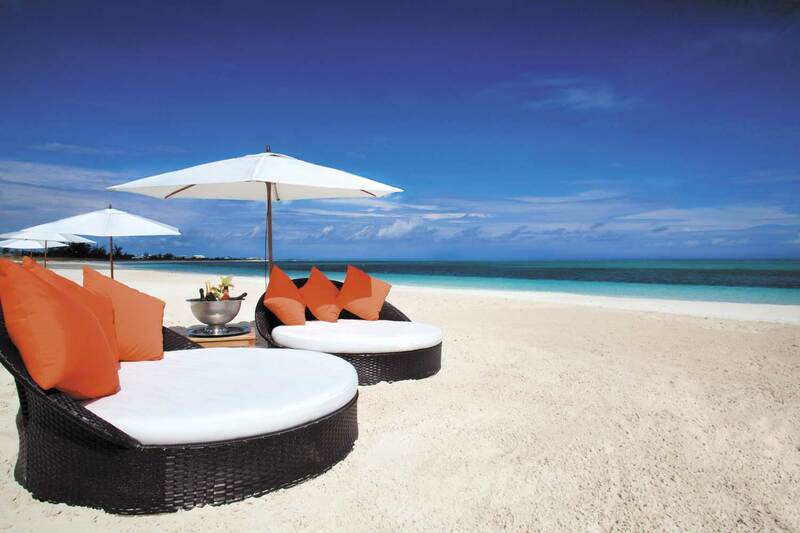 With established locations in New York City and Miami Beach, the Turks & Caicos became the next logical stop for a Caribbean get-away. From the resort’s opening in March, 2009, celebrity sightings have been abundant, with the intimate property and relaxed atmosphere allowing most to feel comfortable enough to mingle with guests. The resort and its Exhale spa have already received Condé Nast Johansens recommendations. And when New York’s “happening” BAGATELLE and The ONE Group opened the Bagatelle Bistrot & Beach Club here, it brought another huge following to experience the Provo interpretation of their signature vibrant and playful atmosphere. From your first step onto the Wymara Resort property, you’ll feel the vibe of Caribbean “cool” and chic style. The resort’s exterior presents a sleek, modern architecture combining white native stone, clean lines, geometric designs, accents of light wood and a predominance of glass. The lobby entrance features a shimmering waterfall wall and the rhythm-rich tones of jazzy world music bring a background beat to your stay. The resort’s social signature is its 7,000 sq. ft. infinity-edge, mosaic tiled pool, with unique palm-shaded “floating islands” for sunbathing and intimate dining. Enticing from any seat in this centerpiece is a view of the aqua seas and sugar sands of Grace Bay Beach, just beyond the pool’s end. Ultra-comfortable lounge beds beckon on the expansive pool deck, complete with a hot tub, dining oasis and natural cooling by the gentle trade winds. 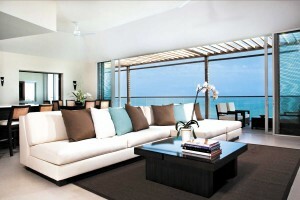 Wymara Resort offers 91 rooms, encompassing 32 suites and 4 penthouses, and promises ocean views from every one. Interiors are ultra-modern; minimalist without being stark, not lacking any amenity. 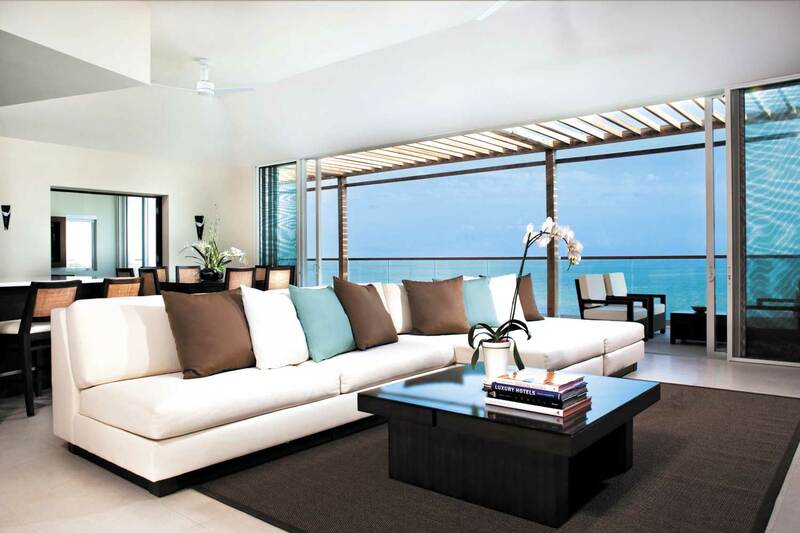 Each suite includes a private oceanfront terrace with floor to ceiling sliding doors and windows, and because the ground floor units are raised well above the dune line, lower levels don’t lack for enchanting sea views. Suites offer full, modern kitchens with marble countertops and energy-saving Liebherr, Gaggenau and Bosch appliances. Guests can sink into luxurious Sterling Hospitality Sleep System beds, with Frette bedding, towels, robes and slippers. I was enthralled by the oversized bathrooms with their huge, glass-encased rain showers and spa tubs that fill from a spout in the ceiling. Other special touches include complimentary WiFi in rooms and throughout the property, large screen LCD TVs, DVD/CD players and Bose stereos with iPod docking stations, along with framed photographs of island landscapes by local photographer Steve Passmore. And then there’s the oceanfront . . . simply stunning and beautiful by nature. The Gansevoort is situated on a 400 foot sweeping curve of the quiet western end of Grace Bay, voted by Condé Nast as the “best beach in the world.” A long deck of natural wood leads guests over the dune, where shaded lounge chairs, a beach bar and full food and beverage services wait. Although relaxing is usually a top priority, watersports, fishing, scuba diving and private yacht charters can all be arranged by the 24 hour Les Clefs d’Or concierge, along with land-based excursions, golf, tennis, horseback riding and eco-tours. The resort’s Kid’s Club includes sailing and snorkeling classes and ecological education. The tranquil, aromatic, beige-toned spa has three treatment rooms (including a popular couples massage room), each opening onto a private garden area with outdoor shower. A long list of therapies are on offer, from massages and waxing to facials, manicures and pedicures (in the country’s first pedicure chair). Certified therapists, led by Spa Director Tammi Morris, use Grn products (said to have immediate results!) and sell their products and clothing in the boutique. Spa services are also available in guest rooms or at the oceanfront pavilion, where classes are held. As part of Gansevoort’s desire to become a part of the island’s social fabric by encouraging residents to enjoy the resort, Exhale is currently offering one month of unlimited mind-body classes for $100. Friends who have tried the classes vouch for their challenging “transformational fitness experience.” Already popular with the fitness cognoscenti, restorative spa retreat weekend packages are also open to residents. Apollo Development’s Managing Director Rob Ayer has been the inspiration for the project since its inception as a mere dream in 2006. Originally named The Watermark, then The Wymara, its fruition is a testimony to his ongoing drive and determination. Besides completing a glorious end result, in the process Rob evidenced his commitment to protecting and sustaining the TCI’s beautiful and delicate environment. At the start of construction, all the native vegetation was removed and maintained at a nursery, to be reintroduced during landscaping. He was also the main sponsor of the Bight Children’s Park directly to the west, serving to sustain the dune and natural area, while providing protected parkland and prime beachfront, along with restroom facilities and a playground, for children and families to enjoy. Rob has also incorporated many measures to ensure the economical and ecological running of Gansevoort. This includes a BIONEST system to change wastewater into potable water for irrigation, along with the rainwater that is captured and stored. There is low voltage lighting in the units and around the grounds, with low E windows and doors. High efficiency VRV Air Conditioning units save approximately 40% on energy consumption, and an Energy Management System turns off lights and reduces A/C consumption in unoccupied rooms. Solar power is used to heat the pool and environmentally friendly cleaning and laundry products are used throughout. Biodegradable/reusable products are purchased when possible, and there are ongoing environmental awareness programs for staff and guests. For these efforts, the Gansevoort was the first TCI resort to be recognized with the “Green Star Award” at the TCI’s Sustainable Tourism Conference in 2008. The Bagatelle Bistrot has already attracted attention to its unique gourmet menu and stylish vibe. 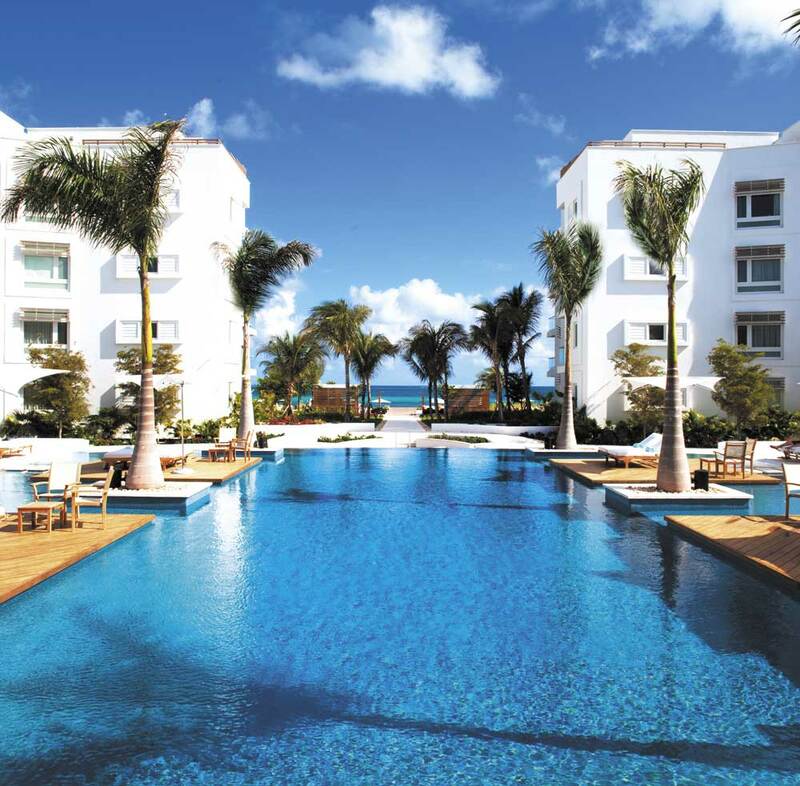 Eager for a new experience, residents enjoy its daily happy hour specials and bi-monthly beach and pool parties. This May, the resort hosted the Red Cross Red & White fundraiser, “the” social event of the season with hundreds of people attending. Besides 24-hour room service, The One group also offers gourmet catering for meeting, special events and weddings. There is a 600 sq. ft. indoor event space as well as a variety of indoor and outdoor function venues. An on-site wedding and group function coordinator makes it easy to take care of details. An eclectic mix including families and a number of Europeans, guests’ reviews of the new resort have been rave, with TripAdvisor rankings consistently “excellent.” Recent comments range from “A feast for the senses” to “Perfection on Grace Bay” and from “It feels like your own private oasis” to “The epitome of a perfect vacation.” In fact, one bride’s wedding blog inspired three others! Many comment on the service, “helpful but not obsequious, friendly but not too familiar and willing to go out of their way.” Gansevoort’s Vice President of Business Development Tamara Moore lauds the staff, who are committed and passionate about their jobs, with a strong sense of pride. With the focus on hiring Belongers, the resort seeks sparkling, special personalities who are eager to learn and grow. If all of this whets your appetite to be part of the Gansevoort lifestyle, there are still condominiums for sale in a variety of sizes. Most offer lock-out studios that can be rented even if you are using your unit; units can often be combined into larger spaces as well. The multi-branded, professionally managed, Preferred® Hotels & Resorts property taps into a steady stream of travelers eager to experience the Ganesvoort’s signature approach to luxury lifestyle, helping to reap a higher return on investment.